The laminated glass bathroom swinging door system comes to solve problems in installation time, since the glass is in stock and ready to ship with excellent packaging. It consists of glass with rounded edges and top quality polishing, in addition to its special price. Its security system solves many dangers since the laminated glass if broken remains fully bonded. Remember that even if we put in tempered glass in our bathrooms, if this breaks into small fragments can cause us serious injuries as we are without clothes while bathing. 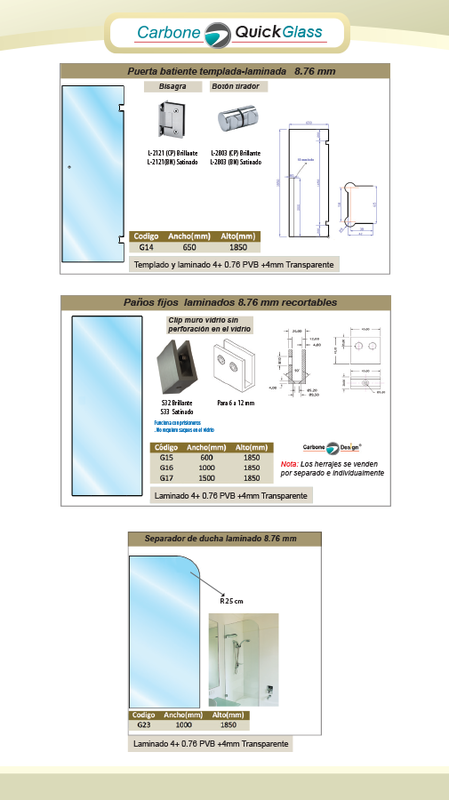 The door is laminated, tempered and have perforations, while the panels are fixed, laminated and anchored by a clip connector specially designed to work without drilling . The system is completely safe and a unique design of Carbone.